This Easter I want to really focus and feature items for your Easter gifts and Easter baskets that are healthy, organic and not full of sugar for your children! There are so many great products out there that will make any child so happy and their taste buds just as happy! Today we are starting out our Easter Gift Guide by featuring one of my favorite organic baby and children's food brands: Plum Organics! All my children ate Plum Organics baby food when they were just starting out with solids and I am so excited that they now have a new food item for my older children too: Plum Organic Soups! These organic soups are delicious and are so easy to heat & eat! Spoon for spoon and sip for sip, nothing satisﬁes a hungry tummy quite like a bowl of soup. They started with the tastes that kids crave and amped up the awesome with different types of veggies and protein in every bowl. So whether you’re punching up mealtime or just need a break from the kitchen, you can still help deliver the fuel they need to keep going… and fast. Because when you’re busy and they’re hungry, every bite matters. • At least ¼ cup of veggies in each pouch! 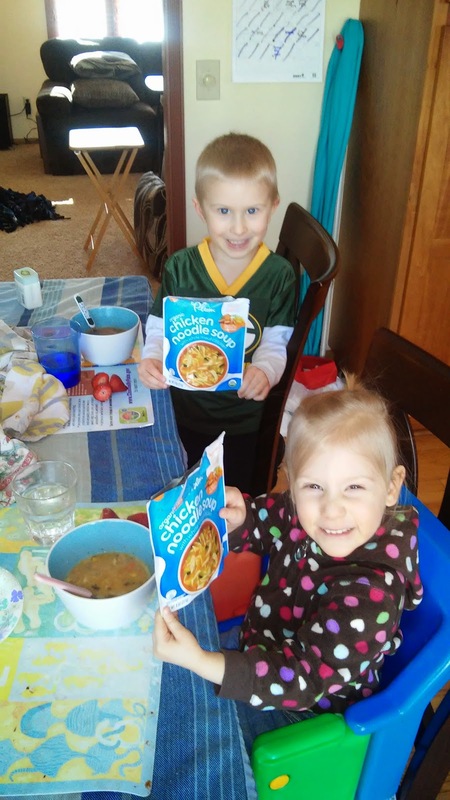 My children LOVED these soups! They were full of flavor and tasty meats and veggies! I LOVED how easy they were to heat up on the stove and how it gave me a healthy change from cooking! :) I don't have to feel guilty when I am feeding my children these soups instead of something I have cooked. And don't forget your little baby this Easter. My son is lovin' the baby food, the different varieties they offer and how tasty and healthy they are! I love that they are all organic, they make mixes that no one else does, and they are in easy to use pouches! They are perfect to fit in any baby's Easter basket this Easter! You can purchase all Plum Organics products from your local retailer or from the Plum Organics online store.